Great handle design makes brushing fun! Make brushing fun with this collectible Angry Birds character powered toothbrush to help encourage children to brush. This battery operated toothbrush gives kids more cleaning power than a manual toothbrush. The compact rotary head makes it easier to clean hard-to-reach areas of the mouth. More oscillations and brush strokes means more plaque removed. Also, the soft bristles massage the gums to help against tartar build-up. 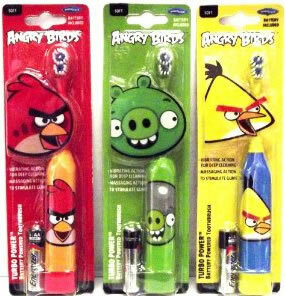 Kids can now defend their teeth against cavities with the Angry Birds "Yellow Bird" Toothbrush.